Fresh out of college in the 1980's, I was lucky enough to immediately start working as a Junior Industrial Engineer in a semiconductor company. Since college, living away from my parents' house wasn't new and so I quickly adapted to life in a boarding house. The boarding house was a quick 5-minute jeepney ride to my work place and so that made it convenient. But even more convenient was the location of the first fitness gym that I joined. The gym, named ProdiGym, was a good walking distance from my boarding house and was in between my workplace and the boarding house. It wasn't a big gym. It was at the second floor of a small building. Right out of the stairs was the receptionist/cashier. What greeted you inside the door were the squat stands and the lat machines. All the free weights and weight machines were in one big room. There was another room for aerobics class where they had some stretching poles and exercise mats. In a corner was the entrance to the 3 cramped shower stalls. I remember having showered in one of these stalls only once. This was because it was more convenient for me to walk home and take my shower at the boarding house. 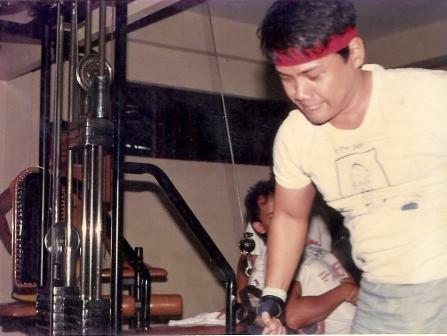 The other equipment I remember in that small gym were an inclined ab board (hardly used), a couple of benches, and a pec-deck machine. Like I said, it wasn't a big gym but it certainly beats the improvised weight exercises I did in college. With an 8-to-5 job back then, working out for me was after office hours. Having many of my co-employees work out in the same gym was a joy for me. Being in the company of friends, and motivating each other while working out was enjoyable. It was homey and cozy. That's until one of those muscleheads who hog the weight equipment show up. The gym had a trainer, named Lito, I think. He wasn't exactly a big guy but he had a big chest and looked muscular enough for a small guy. He was affable and was very helpful to everyone. One of the tasks he had was to interview each new member and drafted a few exercises on a sheet of paper for the beginner to follow. Here's me, getting my first dig on weight exercise machines. Yeah, that head band was pretty much part of the 80's look. I'm supposedly doing an exercise I no longer remember. Maybe it's cable crossover exercise for the pecs (right pec only). That's Lito the trainer sitting behind me and showing off his pecs and biceps. I no longer know when or how exactly the gym folded up, but I remember business going bad especially when many of the regulars started quitting. Many of them were my batchmates and just had to succumb to the pressures of work, change of work schedules, overtime. Each just had their own excuse for not showing up at the gym.